I'll repeat task description from previous articles: "Create autocomplete functionality on Google Cloud Platform for eshop so that when user searches some text it returns products name which contain that text". As a real life I am using Best buy data of their products. Webserver which renders search page and results is done in Flask framework (Python) and deployed on Google App Engine Flexible. Reason why I am using Flexible and not Standard is because at this time, it's not possible to connect to Cloud SQL PostgreSQL from GAE Standard. Code for this project is in Github repository. Automatic backups, it's possible to define daily window when backups should occur. Note: if you don't have set zone and region in your configuration, you can set it there or you can use --zone and --region flag to specify region and zone where database instance should be. Note2: It good to have web server and database instance in the same zone for best performance / smallest latency. Default user postgres is automatically created which I will use for this example, but I need to set password for it. """creates multiple row (objects) and commits into database"""
I defined class Product with some fields and special field is search_vector where is defined vector for text search and fields that should be indexed. So when instance is saved (row inserted) it automatically processes text from product_name and fills search_vector field. Other than that, there is nothing much special, I created methods for bulk uploading, querying, creation and deleting table. We have 1.2M rows of product data and since SQLAlchemy searchable works only when objects are save through SQLAlchemy, straightforward import of massive csv file is not possible unfortunately. That's why I wrote script to create and save objects into database (which is not most efficient way, but I guess I don't have a choice). Other thing is that since I want it to be as fast as possible, I'll create server in the same zone. (try to upload from your local computer and you'll notice big difference, especially if database instance is in the other half of planet). I'm adding specific scope for compute engine so it can be authorized to use Cloud SQL and I'm using preemtible since this will take less than hours and... every cent counts. I'll copy code whole of repository since inside of it I have my csv file with products data. This can take few minutes since there are many files, simpler would be to zip it and copy just one file and then unzip it. finally check if variable PRODUCTS_LOCAL_PATH in settings.py in root of repository reflects path on server, if not update it. second line (connectionName) contains information we need. Connection name is usually in format <project-id>:<region>:<instance-name>. 2018/08/08 12:58:31 New connection for "adventures-on-gcp:us-central1:myinstance"
Hopefully there will be no errors, script prints timestamp for every 10000 inserts. Whole process took for me around 15 minutes. Web server is basically same as in previous articles, simple Flask application with some endpoints which I will deploy on Google App Engine. There are specific configurations which are needed to be set in app.yaml file for GAE regarding Cloud SQL connection. This is how app.yaml looks life. # when configuring your Cloud SQL instance. I use environmental variable SQLALCHEMY_DATABASE_URI to distinguish connection configuration when I use database locally (through proxy) and on GAE (used in sql_search.py). This make take some time (sometimes even 10 minutes) since Docker image is created and deployed. Since everything is working ok, as in previous cases I am doing load testing using Locust framework deployed on Kubernetes cluster. 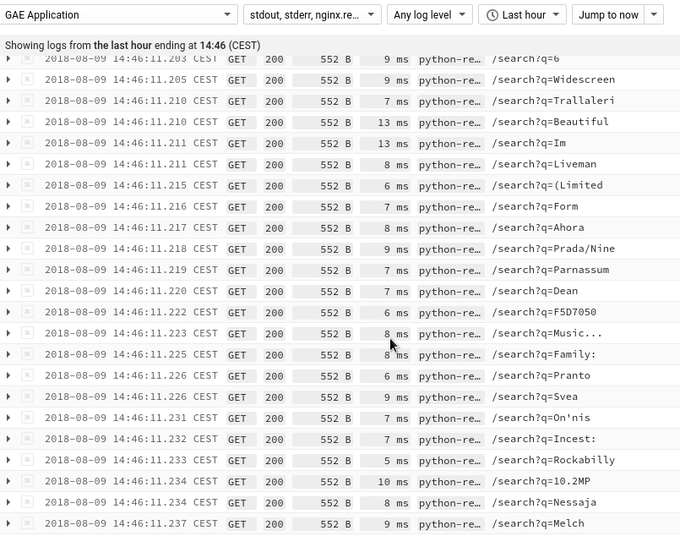 More details are here https://www.the-swamp.info/blog/search-google-cloud-platform-app-engine-and-search-api/ (under Load Testing) and how to set up cluster here https://github.com/zdenulo/gcp-search/tree/master/load-testing. For the testing purposes, I deployed GAE app with 10 instances already running (with autoscaling) since GAE Flex is much slower than GAE Standard in terms of spinning new instances, I didn't want that autoscaling influences results. I was running up to 2000 users with hatch rate 5 users per second. 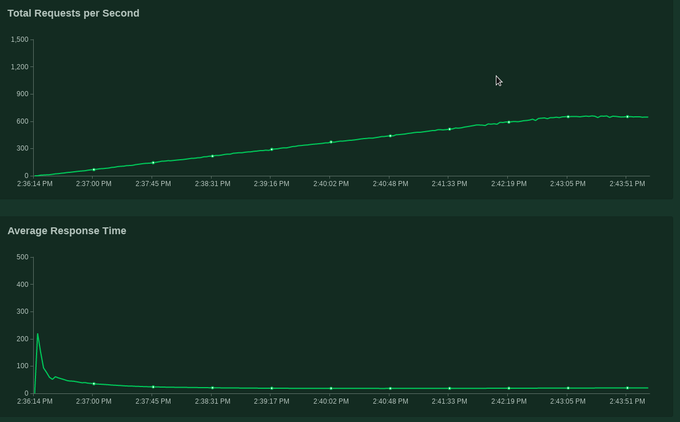 As it can be seen from graph, test lasted about 10 minutes, there were no server errors or similar, in the end I think it spin up 13 instances altogether. In total there were 218816 requests with median response 16ms and average 20ms which makes it fastest solution so far. Worth noting is that database server had peak CPU load around 30%. 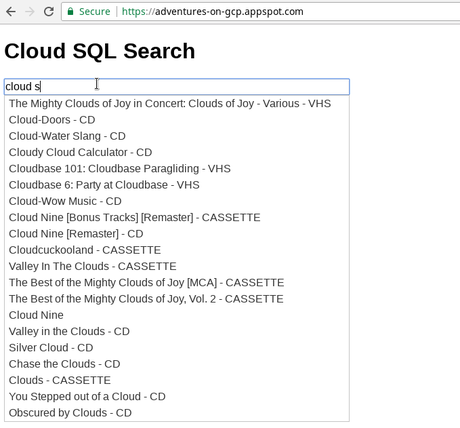 Since PostreSQL is battle tested and one of the most popular open source SQL databases and provides lots of additional features, it can be great choice to be used for eshops database storage or similar. Cloud SQL on top of that provides managed features like possiblity to easily scale server instance, automatic backups, high availability.